At Rock Bottom Golf, your satisfaction is our top priority! If for any reason you are not completely satisfied with your qualifying purchase, you may return that product for full store credit. Look for the 90 Day Performance Guarantee icon for all qualifying products. Cobra Connect sensors are now included in every club in the F8 family. You get GPS access to more than 40,000 golf courses to help track your game. The sensor records each swing, displaying results on your smart phone. With more access to data, you track your round, improve where you need it, and share and challenge your friends. The KING Black ONE Length wedges have been re-engineered for 7-iron weighting, length, and lie angle to deliver more consistency and simplicity to your short game. CNC Milling creates highly accurate grooves for consistent spin across the entire face. COBRA’s most durable satin black finish ever, DBM (Dimonized Black Metal) provides extreme resistance to wear for longer lasting, better looking wedges. COBRA’S patented CNC milling technique delivers optimized surface roughness across the face to maximize spin and control for more precise shots around the green. Progressive groove constructions feature wider, shallower grooves in weaker lofted wedges and narrow, tighter spaced grooves in stronger lofted wedges for optimized spin and trajectory around the green. A taller muscle back design damps vibrations for improved club harmonics that translates to a soft yet solid feel at impact. 3 wedge grinds available in select lofts allow you to enjoy more versatilityfrom a variety of lies and turf conditions around the green. It's difficult to review this wedge on it's "One-Length" properties. Admittedly, it was difficult to adjust at first but I was determined to give it a proper try. Being so long compared to a standard length wedge... the head feels very light, which too adjusting. Performance: A stock swing produces a very high, baby draw. It can be flighted down, but again takes practice based on the lenth. Bunkers: Being so long, you think it was hard to hit from bunkers. On the contrary, I hit this wedge really well from greenside bunkers. Tons of spin. The black finish holds up really well, but after several shots from the sand, the face is going to start to lighten up. If you're into OL clubs, I'd give it a go. Based on the use of this club, I'd definitely consider Cobra wedges in the future. I love this club. It was delivered on Tuesday when I ordered on Saturday night, which was amazing. The club looks even better in person and feels way more soft than I thought it would. ProsLooks Feel Weight Did I mention the look? These are really nice wedges. They have a soft feel, with good spin. I got the 54 and 58 degree in Versatile grind to complement my new cobra king forged irons (also all black). The DBM is an awesome finish, and obviously S200 True Temper shafts complete the package. I really love this wedge. It works good around the green and I can also make good contact with a full swing. Adjustable 3/4 Iron with stiff shaft. Love to shoot this. 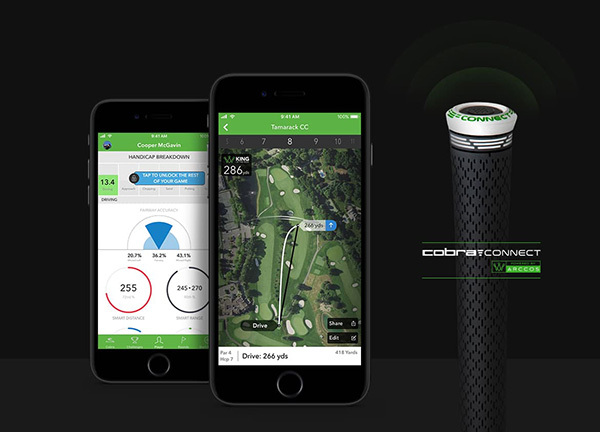 COBRA Connect included to track distance and stats. I bought the 50* with the versatile grind. I've played 2 rounds with it and had it dialed in after the first round. I have yet to use the Cobra Connect, as it's the only club that I have that option with, so it doesn't make sense for me to use, but if you have others with the connect grips, you might like it. Using my approach wedge less and less. I'm thinking about going with a 60* as well. ProsGreat club. Glides across the just about any lie. Great feel, plenty of spin!